A greatly capable country like India that comprises people of a multitude of talents is surely not so downtrodden that it needs to earn foreign exchange by such lowly means. The present scenario of cattle on the streets of India and some of the state government’s goshalas is highly deplorable. 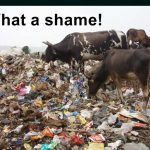 The cattle feed on garbage dumps, and the government cattle sheds have no supply of food, water, sanitation and veterinary services. Since 2005, only up to Rs 10 per cattle have been allotted to each cattle (as per their policy) in Delhi Government goshalas, and even then this much water worth is not provided to them. There is 100% mortality rate as per various RTI replies obtained in this regard. Any complained filed with them is outrightly dismissed without any significant reply. 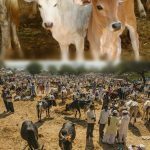 Cattle are seen eating in the filthiest of garbage dumps, even so in front of cremation grounds of Haryana, Uttar Pradesh, Rajasthan and other north Indian states. Various arguments in favor of cow slaughter state that India is doing well by earning foreign exchange by export of beef. A greatly capable country like India that comprises people of a multitude of talents is surely not so downtrodden that it needs to earn foreign exchange by such lowly means. 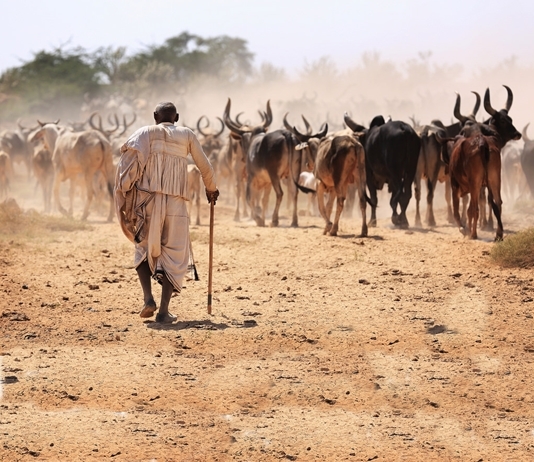 The lack of empathy of the Central Governments in the past 10 years or so and the non- uniformity of the state laws concerning cattle protection have left very few options to protect the cattle. One such option is rich Hindu temple trusts coming up to their aid. 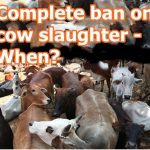 Once serious steps are taken to stop cattle smuggling to Bangladesh completely and cow slaughter is prohibited across the states with uniform legislation, interstate cattle smuggling shall come down also. The major solution to the present scenario can be attained once rich Hindu temple trusts make goshalas in several states at a time. The rich temples of south India such as Tirumala Tirupati Devastahanams, Shirdi Sai Baba Trust can operate effectively in North India also with their local temples opening up in many north Indian states, accommodating some of the rescued cattle from smugglers and slaughterhouses. These temple goshalas operating in each state can be collaborated by other trusts as the Vaishno Devi Shrine Board, Kashi Vishwanath and the like. These goshalas can be either centralized or decentralized, depending upon the prime policy of the parent temple. Also, they shall be self sustaining, since the major expenditure of these goshalas shall be borne by the sale of milk products, as well as the products made from cow dung and urine, both consumed domestically and for export. This increases the production of milk, and milk products, medicines made from cow urine and dung, and shall put a stop on the rivers of blood flowing through this country. 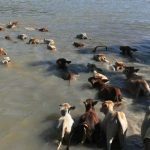 The ideal goshala model run by an American national in the state of Haryana concentrates on the fact that cattle like to freely roam, and the dependence on humans should be minimum. Other than a boundary of the temple for protection, they can naturally habitat there grazing, drinking running fresh water, and living as a community. This can minimize the effects of any strike, or man-made negative effects on the availability of their food and water. The temple trusts can be joined and effectively collaborated state wise in such operations by some non-profit organizations. 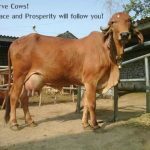 Solving a major share of the problem of housing rescued cattle from slaughterhouses other than the state run goshalas, India shall once again attain the status of a humane country which earns foreign exchange from export of milk and products instead of beef and blood reviving her ancient glorious culture and reputation. Next articleStruggling to have absolute faith in God? Read this!